Fall is the season for festive feasts and family travel. While most places are hunkering down and layering up for the frosty temperatures, Southern California’s tourist market is continuing to see visitors from all over the country looking for fun in the sun. For residents, this means an uptick in visitors and for vacationers, this means trying to find just the right spot to stay while finding reprieve from the cold. 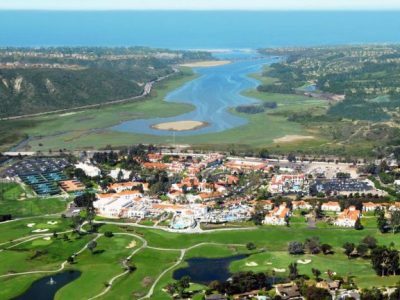 There are endless options to consider when looking for a place to stay in Carlsbad. Whether you’re an avid hiker, wine connoisseur, or just want to relax by the pool, there is something for everyone to enjoy during the fall months. For those wanting a true beach getaway, the Beach Terrace Inn is the perfect place to book a room for the holidays. 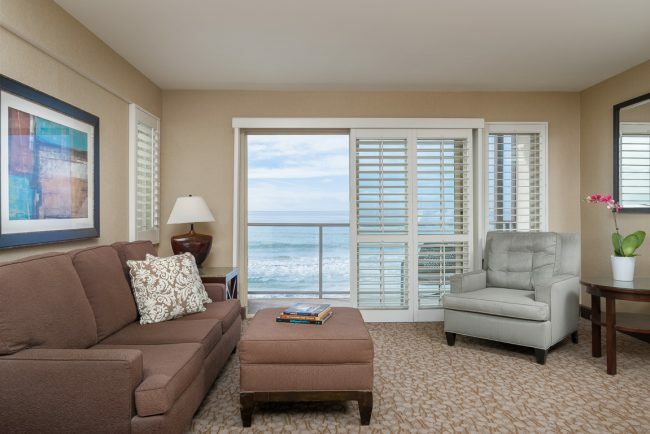 As the only hotel in Carlsbad with private beach access, the Beach Terrace Inn is one-of-a-kind. The Inn has been around since the 1960’s and still holds on to the value of being family owned and operated. Originally, the Beach Terrace Inn rooms were used as apartments. Now, the hotel rooms are large and spacious – perfect for groups of all sizes. The family vibe resonates from the ownership to the employees, providing guests with a suite of offerings that are rarely included in modern day establishments without extra fees. The Inn takes pride in including these amenities into the costs of the rooms, making it a point to ensure that guests are cared for during their stay. The rooms at the Inn are configured to meet the needs of single travelers, couples, and families alike. Guests can decide whether or not they’d prefer a view of the well-manicured courtyard, or the expansive private beach jutting up against the west side of the property. Rooms with a courtyard view are available with a king bed or two double beds. 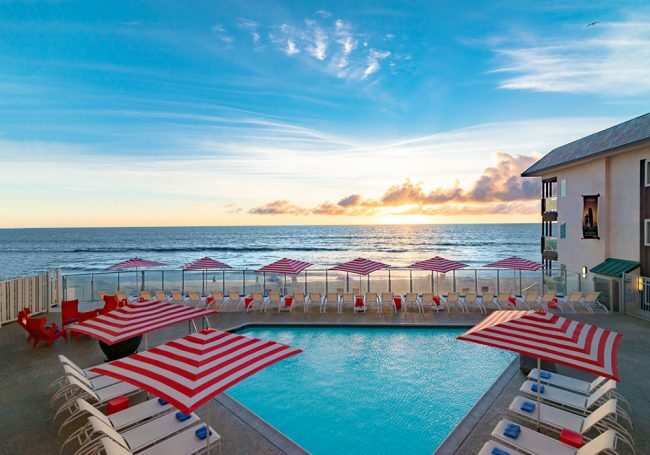 From there, the Inn offers rooms with partial ocean views, poolside views, poolside terrace access, full ocean views, and cabanas with private balconies and direct access to the beach. Rooms are equipped with free Wi-Fi and flat screen TVs. Guests can truly enjoy the concept of wide-open spaces with the expanse of the Pacific Ocean just steps away. While staying at the Inn, no stone is left unturned by the hotel staff. 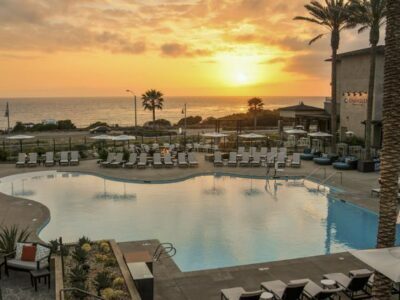 Free parking, beach valets, and breakfast are just a few of the amenities that come included with each stay. The property is child friendly and the staff offers guests direct access to a concierge who can provide door to door service for activities in and around the hotel. Guests can forget the worry and hassle of lugging beach umbrellas and chairs from their rooms to the water and rest in the assurance that a warm cooked meal can be ready after a long day of rest and relaxation. The staff is committed to making sure that guests are fully able to experience the natural beauty that surrounds the property. If you’re looking for somewhere to get away from the cold or need the perfect excuse to lure family and friends to the west coast, the Beach Terrace Inn is the perfect locale for visitors this Thanksgiving season. Be sure to take advantage of fall savings and book a room before it’s too late.